If you happen to order Pasta con broccoli in Sicily, you will get delicious cauliflower pasta. Do not blame the waiter, he is perfectly right, as in Sicily cauliflower is called broccoli, while the light green broccoli (Romanesco broccoli) are cauliflower and the dark green ones (the traditional broccoli) are ‘sparacelli’. A bit confusing, but the language enhances the independence of this beautiful island. Whatever you call it, pasta with seasonal vegetables is a popular dish in Italy, with plenty of variations and inspirations. It is the perfect example of cucina povera: inexpensive, traditional, healthy. The sweet and sour pasta with broccoli (cauliflower) alla Siciliana is made with raisins, pine nuts, anchovies and saffron. I like to prepare it with short pasta, such as maccheroni, but both bucatini and spaghetti would work as well. Remember to keep the cauliflower al dente and to add the saffron at the very end. You will preserve its full flavour. Soak the raisins in hot water for 15 minutes. Drain and pat dry. 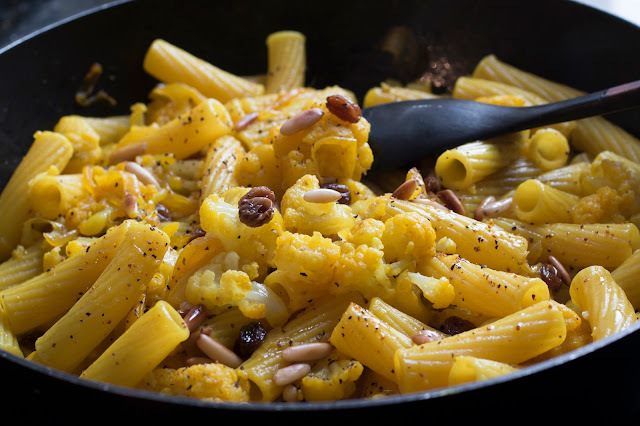 In a pan, sauté the pine nuts without any fat for 4 to 5 minutes until just golden, stirring frequently. Transfer to a bowl; do not leave them in the pan, as they would keep on cooking, even off heat. In a large frying pan, heat 2 tablespoons of oil and sauté the onion with a pinch of salt on low heat for 10 minutes, until translucent. Stir the anchovies into the onions and cook until dissolved, 2 to 3 minutes. 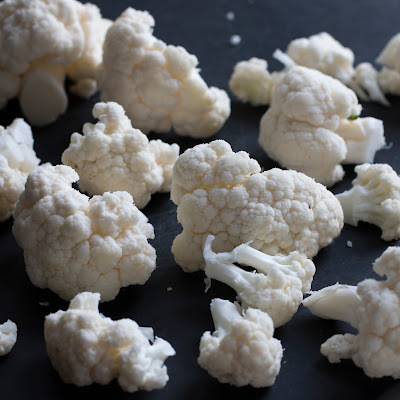 Divide the cauliflower in florets and boil them in plenty of salted water with a good pinch of salt for 5 minutes. Drain and keep the water for the pasta. Add the florets to the onion along with two tablespoons of their cooking water and leave to cook on low heat for 5 minutes, stirring occasionally. Dissolve the saffron in 2 tablespoons of hot water and add to the cauliflower sauce. Stir well. Cook pasta in the cauliflower water until al dente. Drain, reserving one ladleful of cooking water. Add pasta to the cauliflower, stir in half of the cooking water and sauté for 2 minutes on high heat. Sprinkle with pine nuts. Serve at once, with a drizzle of oil.